chosen especially for this collection. “I really did love the EP project, and I’m kind of sad that it’s over,” Crenshaw comments. Forgotten” and vintage numbers by the Easybeats, the Move and the Lovin’ Spoonful. 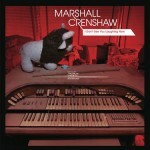 when I did it, or why, but I like it!”, says Crenshaw). acclaimed indie troubadour Dan Bern, who co-wrote four songs with Crenshaw. Science, #447, What’s in the Bag? and Jaggedland. flame continues to burn as brightly as ever.